Editor's note: The author of this story, Deborah Cotton, passed away on May 2, 2017 due to complications from her injuries. She was 52. I never thought I'd end up getting shot. Most people don't, I imagine. My odds were, however, somewhat higher than the average American given that 1) I live in New Orleans, which has one of the highest murder rates in the US, and 2) as a reporter, I cover cultural events in neighborhoods with high violent crime rates. Still, I've lived a somewhat charmed existence. I seem to have a knack for leaving the scene just before shots are fired, or I show up immediately following a tragedy, when police and EMS have already arrived. But when two gunmen opened fire on a crowd at a parade I was filming on Mother's Day in 2013, I found myself caught in the crossfire, one of 19 people shot in the largest mass shooting of our city's history. Miraculously, we all survived -- like I said, I seem to have a charmed life. Well, as charmed as someone who's been shot could have, I suppose. You've seen the raft of news stories about the mass-shooting epidemic in America; you've likely heard even more solutions, all the way from "Get rid of all guns!" to "Give everyone a gun!" 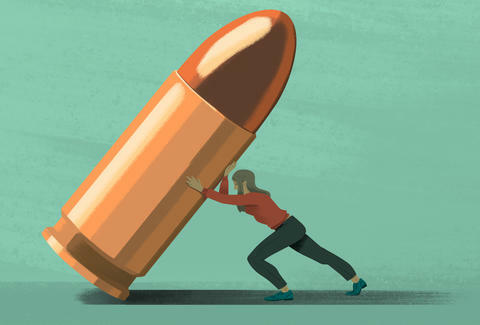 Too often, though, the victims of gun violence are forgotten; most people don't know what it feels like to get shot, spend weeks, months, years in recovery, and never be the person you were before. This is it. I'm about to die. So, what is it like to get shot? When the bullet hit me, surprisingly it didn't hurt at all. Not one bit, which shocked me. I remember thinking, "That felt like someone just chunked a small pebble at me," the way my cousins and I used to do during summers in my grandmother's podunk Texas town with unpaved roads and two Dairy Queens. Considering the action around me -- people shrieking and running, gunfire echoing in the street -- there was no reason to believe an errant pebble, some random fragment of pavement, was the cause of my shock. I reluctantly accepted that I must have been shot. I waited for the white light. For the feeling of my soul lifting or a hand reaching out. The bullet entered my side just above my right hip, traversed diagonally upward, and lodged itself just below my left rib cage. Instead of pain, there was a burning, aggravating sensation in my stomach area, growing outward from where the bullet traveled. As I lay there in the street, fading in and out of consciousness, I remember thinking, "This is it. I'm about to die." I've been a spiritual person for most of my adult life, taking my cues and direction from a higher power that I believe co-orchestrates my life and destiny with me. There are crossroads moments in my life and destiny, moments that change everything through some combination of fate, higher power, and my own decisions. If ever there were a crossroads moment before me, this was it. I remember doing a quick mental life scan, asking and answering my crossroads checklist: "Am I really ready to go? Have I done everything I was meant to do?" The bullet had landed in a place the surgeons nicknamed the "Soul Hole." I'd done most of the things I'd wanted to accomplish. I traveled. I did work that made the world a better place. I didn't experience marriage, but hey… can't have everything, right? "OK," I thought, "if this is it, then I'm ready to go." Then I waited. For the white light. For the feeling of my soul lifting or a hand reaching out to take mine, or any of the other sensations people who have "died and come back to life" describe. None of that happened. After about 90 seconds passed, I realized, "Hmm… I may not be dying after all. I wonder if… God forbid, am I paralyzed?" I wiggled my toes, then my ankles; it was all good. So I wasn't dying, and I wasn't paralyzed. As I continued to take inventory of my body and soul, that burning sensation in my stomach where the bullet traveled began to take over my focus. "Man, what I wouldn't do for a few Percocets right now!" I thought. There still was no sharp or shooting pain, nothing like what you think you'll feel when a metal object rips through your body; only the hot burning radiating through my core. I was later told that the 9mm used in the shooting accounted for the lack of initial pain: The bullets were the kind that stay intact, rather than the kind that explode into flesh-tearing shrapnel. Nurses on either side of me began shouting, restraining my hands. My boyfriend knelt on the ground next to me. I was wearing a dress that kept flying up with the wind, so he took off his jersey and covered me with it. I could feel him cupping my face, rubbing my heart in circular motions, and I heard his voice telling me to hold on, that help was coming. I heard people screaming all around me. I knew there were many others like me, shot, lying in the street. Who knew how long I'd be there, how long we'd all be lying in the street, going in and out of consciousness as we waited for someone to help us. Which eventually happened, though I remember only a few brief snatches of those early moments in the hospital. I awoke while on a gurney in the elevator, felt tubes in my nose, and began to yank them out. Nurses on either side of me began shouting, restraining my hands and trying get the tubes back down my nose and into my gut. Most people who catch a bullet there don't survive. So many drugs coursed through my body, so many faces and voices passed in and out of awareness. My closest friends, my magazine editor, the mayor, and the mayor's spokesperson had all converged on the hospital and were sitting sentry, worrying. Of the 19 people shot, my injuries were the most severe, and my prospects for survival were not good. The bullet had landed in a place the LSU surgeons nicknamed the "Soul Hole," because most people who catch a bullet there don't survive. To worsen matters, I'm told that I repeatedly refused to give the hospital consent to operate. I don't know why I was so obstinate, but somehow my friends were able to convince the hospital to override my objections and perform the life-saving surgeries I needed. I stayed in the hospital just shy of two months, enduring 12 surgeries and losing a whole lot of body parts, along with my entire recollection of those first few weeks. One of the major life-saving surgeries I received was a Whipple procedure, a complex surgery normally given to people with pancreatic cancer, in which several organs are removed and the remaining organs are reconnected in a way that allows the patient to live. Today I walk among the rest of the population minus a colon, a gallbladder, my right kidney, a portion of my pancreas, a bile duct, a duodenum, and two-thirds of my stomach. I'm also missing the bullet, the 9mm scrap of metal that caused all this damage. Immediately after I was shot, the surgeons didn't want to risk digging around looking for it, so they left it there. A year and change later, I eventually entreated one of them to remove it during one of my numerous surgeries, as it had wiggle-wormed its way closer to my skin surface and was practically poking out under my rib cage. I was hyper-paranoid, terrified that someone would break out a gun. In total, I wound up undergoing 36 surgeries over the course of three years. As you might imagine, I still have some lingering health issues that doctors haven't been able to resolve, but I've learned to cope with them. The impact of the shooting on my mental health, though, showed up in surprising ways. I endured bouts of PTSD during the first few months after the shooting. Once home, I began counseling sessions with two psychologists, both PTSD experts. For a while, I was terrified of being in a car going over 35mph, and I'm not exactly sure why, since driving doesn't seem to have anything in common with guns. I suspect it was the fear of losing control of my body in the face of that kind of speed, but eventually the fear faded away. My first few forays back into attending our regular Sunday second line parades were particularly loaded. I was hyper-paranoid, terrified that someone would break out a gun, start shooting, and I would be too frail to run and protect myself. But I knew my quality of life would be worthless if I allowed the shooting to take away something I loved so tremendously. So I made a pact with God. Now, before I leave to go to a parade or any event in a sketchy neighborhood or questionable environment, I check in with myself spiritually. I meditate, ask The Most High to guide and protect me, and let me know if I should avoid this event or group of people. That way, if I again find myself in a dangerous situation, it will have been for a higher purpose. When I do this, I release the fear and worry, knowing that God has me covered, and I go have a good old time like always. It's been the most important experience of my life. Several local news outlets followed my recovery alongside the case against the young men who shot us, during which I publicly forgave them. I attended their sentencing and took the opportunity to speak to them at great length with love, compassion, forgiveness, and hope. I explained to them that they were meant to do more, to be more -- they were sidetracked, but they have the capacity, even in jail, to make their mark on the world and leave a legacy that goes beyond "I shot up a parade." As fate would have it, I got through to one of them: Akein Scott. He's been sentenced to life in a federal penitentiary. I've visited him in jail. We write each other, he calls me sometimes. We have a real connection; I guess you can say I'm mentoring him now. He's had an awakening, and is taking his first fledgling steps at healing his inner self. I see transformation and redemption in his future. It's been three and a half years since the near-fatal mass shooting. Today, I'm one of a growing number of survivors of violent crime who advocate for criminal justice reforms, like investment in rehabilitation for incarcerated people, reducing mass incarceration, and offering sentencing alternatives. Before getting shot, I was active in criminal justice reform work on a volunteer level. Now it's a career path, and I'd go as far as to say it's my life's new mission -- or my new life's mission. If I can help change the course of even one lost young person caught up in a life of crime, help anchor him or her in positive, legal work that contributes positively to the community, it will have been worth taking that bullet. Sign up here for our daily Thrillist email. Deborah Cotton was a writer and activist who lived and worked in New Orleans. She was active with Crime Survivors for Safety and Justice, and was passionate about New Orleans culture and music; she would have appreciated contributions to the New Orleans Musicians Clinic & Assistance Foundation.